Mazloom, M. (2014). The relationship of metacognitive beliefs and emotion regulation difficulties with post traumatic stress disorder. International Journal of Behavioral Sciences, 8(2), 105-113. Maryam Mazloom. "The relationship of metacognitive beliefs and emotion regulation difficulties with post traumatic stress disorder". 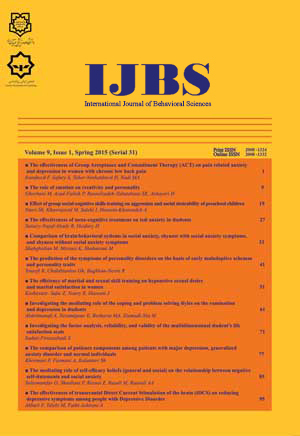 International Journal of Behavioral Sciences, 8, 2, 2014, 105-113. Mazloom, M. (2014). 'The relationship of metacognitive beliefs and emotion regulation difficulties with post traumatic stress disorder', International Journal of Behavioral Sciences, 8(2), pp. 105-113. Mazloom, M. The relationship of metacognitive beliefs and emotion regulation difficulties with post traumatic stress disorder. International Journal of Behavioral Sciences, 2014; 8(2): 105-113. Introduction: The aim of this study was to investigate the relationship of metacognitive beliefs and emotion regulation difficulties with post-traumatic stress symptom and then to determine the influence of each variable on aforementioned symptom.Method: Sample population included 280 high school students from Ahar that were selected by cluster sampling. Next, they filled in PTSD Symptom Scale-Self Report (PSS-SR), Metacognitions Questionnaire- Adolescent Version (MCQ-A) and Difficulties in Emotion Regulation Scale (DERS). To analyze the data, methods of descriptive statistics, Pearson’s correlation and stepwise regression were employed by means of SPSS-16.Results: Findings indicated that post traumatic stress symptom was positively associated with both metacognitive beliefs and emotion regulation difficulties. Results of regression analysis also showed that negative beliefs about worry, cognitive confidence, lack of goal-directed behavior, lack of emotional clarity and cognitive self-consciousness could explain 38% of variance of post-traumatic stress symptom in students with earthquake experience.Conclusion: Results of present study, similar to metacognitive model and theoretical approaches of emotion regulation explaining post-traumatic stress symptom showed that changes in negative metacognitive beliefs as well as the correction of maladaptive emotion regulation strategies can relieve post-traumatic stress symptom.